Convertion of video formats like VCD (DAT), Real Media (RM), Apple QuickTime (MOV), Windows Media (WMV) requires exhaustive processing. The ClipsID Encoder application is an easy to use tool for accomplishing this kind of video encoding. 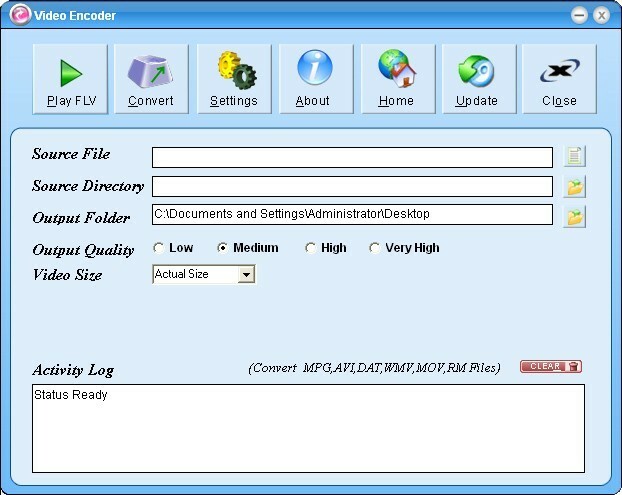 ClipsID Encoder currently works only on Microsoft Windows and can convert AVI, MPG, WMV, DAT, MOV and RM files to FLV format. This is a FREE tool that comes with a self installable option. ClipsID also provides a complete online support system which would help the users in sorting out problems they come across while using the tool much easily. ClipsID is on a constant research for updating the codecs and incorporating the latest trends and technologies of Media convertion and as an when new versions are rolled out, all the subscribed members will be provided with an option for FREE upgrade. Batch encoding helps you in saving huge amounts of time. ClipsID Encoder can be configured to look for all the video files in the specified folder and automaticlally converted to its equivalent FLV versions without anymore manual interaction. The Encoder also has a video convertion quality filter, where in the user can select the type of quality of video they would require after convertion. This helps in reducing large video file sizes without compromising much on the video quality. Encoder can also be used to change the video frame resolution to suit your needs. This is also an effective way to reduce video file size and very widely used for video that would be streamed across the Internet.